Jimi Hendrix, Eddie Van Halen, Jimmy Page, and Eric Clapton. Those are instantly the names that always pop up when you’re discussing the greatest guitarists of all time. There is a pretty major player that tends to get left off the list by many—only because he passed away so young and some of his genius was only truly recognized after his death. Stephen Ray Vaughan was born on October 3rd of 1954 in Dallas, Texas. His father was an asbestos worker and his mother was employed as an attendant at a 7-Eleven convenience store. Stevie had an older brother named Jimmie, who he very much looked up to. Stevie began playing drums and sax at a young age, since those instruments were what his bother played. At age 7, Stevie got his first guitar, a toy with only three strings. He took it upon himself to learn by ear only, playing along with songs he heard on the radio. He showed such promise; he got an electric guitar two years later and really started forming his passion. At age 11, he joined his first band and starting playing professionally in clubs around Dallas. At age 16 he left home and focused solely on his music career. Stevie joined with a couple other guys and called themselves Stevie Ray Vaughan and Double Trouble. They played a jazz festival in Switzerland in 1982 and caught the attention of a record exec from Epic Records. The band put together a demo tape, and the label was immediately interested. It was the big break they were hoping for, and they headed to Los Angeles to record. 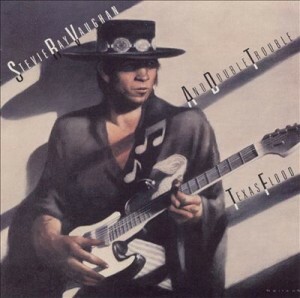 Stevie’s first album,Texas Flood, came out in June of 1983. Since the band had been making music so long, recording only took two days, and much of the record was simply re-mastering older recordings that had been done on subpar equipment. The album was solid hit, going 2x platinum in the states and being nominated for a couple awards. This one is really simple: if you like a guy who can flat out whale on the guitar, this is for you. It’s more or less an hour of straight jamming out, and it’s pretty outstanding. There are certainly a lot of bluesy elements to the album as well, but it has that fun combination of electric rock and blues which I feel Stevie does better than anyone. It’s not a very lyrically heavy record, but on the tracks that do have vocals, his ability is more than up to the task. There is a fun cover version of ‘Mary Had A Little Lamb’, which isn’t something you hear very often. Stevie passed away in a helicopter accident in East Troy, Wisconsin after playing a show with Eric Clapton at Alpine Valley. He would go on to record six albums before his passing; each of them went platinum at minimum in the U.S. He’s credited for reviving blues rock and paving the way for many other artists. We can all honor his memory by tossing Texas Flood on today, and if you groove to his brand of guitar, pick it up for $5 bucks. I had the pleasure to work with both Jimmie and Stevie on several occasions. Both were incredibly talented and they cared a lot about what they did during their performances. Stevie in particular. I remember one time when he practiced the same song about 8 times because it was just not quite right. Hey Felix – that’s awesome! I never got a chance to see him play live, based on some live stuff I’ve heard, he put on a great show. Definitely too bad he passed away so young. Hey Austin – Great Cheap Tune write-up. I fortunately saw SRV in 1989 during his “In Step” tour. I am thankful I had the opportunity to see him live as SRV’s guitar skills were in my mind in a totally different league. Most folks wouldn’t know (Felix obviously would) that after Stevie got sober in the late 80’s he really worked hard on his vocals and it showed in his later recordings and concerts. Thanks Keith – it would have been amazing to see guys like SRV or Hendrix perform live to see how they’d jam out in concert. His vocals were definitely distinguished, which I really enjoy considering so many front men today sound the same. I’ve never really seen any of the “all time greats” in person, maybe a couple of the more modern guitarists like Jack White and Tom Morello.